2015’s winners of the Young Artist Competition stand with Chair of the Symphony of the Lakes Committee Mike Gavin. From left, are: Ben Meulink, Drew Tomasik, Mike Gavin, and David Zoschnick. WARSAW — Wagon Wheel Center for the Arts and Symphony of the Lakes will hold its Second Annual Young Artist Competition at 2 p.m. Feb. 14 at Warsaw Performing Arts Center. The competition will be open to students currently in grades 9-12 who play strings (including guitar and harp), woodwinds, brass, percussion and piano. Students must meet specific eligibility requirements to participate. In order to participate, students must be residents in one of the following counties: Adams, Allen, Elkhart, DeKalb, Fulton, Huntington, Kosciusko, LaGrange, Marshall, Miami, Noble, St. Joseph, Steuben, Wabash, Wells, or Whitley. Entrants must also participate in musical activities in school or have a private instructor who lives or works in the counties listed. 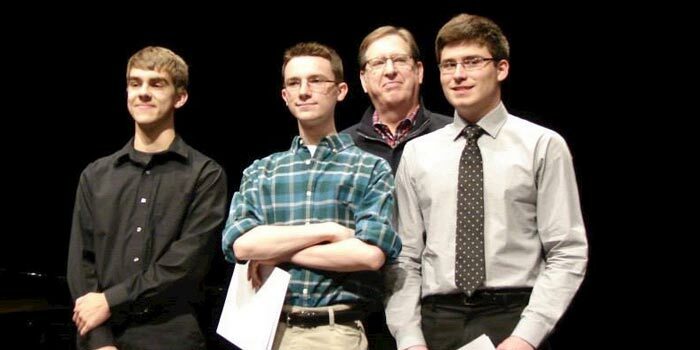 According to Thomas Stirling, musical director and conductor at Wagon Wheel Center for the Arts, this unique opportunity is timed perfectly for those students who are currently gearing up for the Indiana State School Music Association solo contest, and those who are preparing for college-level music school auditions and scholarship opportunities. “Plus, this is a great way to boost a student’s college resume,” Stirling said. Students may apply by downloading a form and mailing it with a Jan. 15 or earlier postmark. Additional instructions will also be included on the website. The event is open to the public and admission is free. Attendees can expect to see excellent local and regional student musicians perform and display their skill.